Mr. and Mrs. Peacock, 11, Marsden-rd, have received official news that their youngest son, Pte. 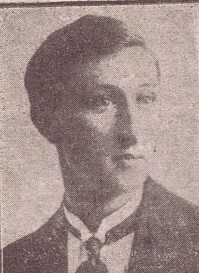 Fred Milner Peacock, 2265, Royal fusiliers, who was reported wounded and missing on June 15th 1917, is now presumed to have been killed on that date. Pte. Peacock, who was 23 years of age, was a painter and decorator on his own account, and carried on business at Lane Head. He attended the Higher Grade School ten years, including the whole period of his apprenticeship, and was one of the most capable students at the Technical School, his art being excellent. Mr. Thos. Crossland regarded him as one of his best students. Trustworthy and reliable as a man, he was of pleasant, frank manner. Officers of his regiment wrote expressing their sympathy with the relatives of the deceased, and 2nd. Lieut. Colin Gill descibed Pte. Peacock as a splendid soldier and well liked by all. His pluck and devotion to duty were an inspiration to all. Pte. Peacock enlisted on Feb 28th, 1916, and went out in August of the same year, taking part in some heavy fighting during the following winter and spring. He attended the Higher Grade School up to his joining the forces. The deceased was single, and was connected with St. John's Church, Briercliffe. A brother, who is serving in the R.G.A., has been out twelve months, and has been gassed, but is in training again at Whitchurch.